Lush Van Nuys Curb Appeal -- Linda Vista Landscape Services, Inc. 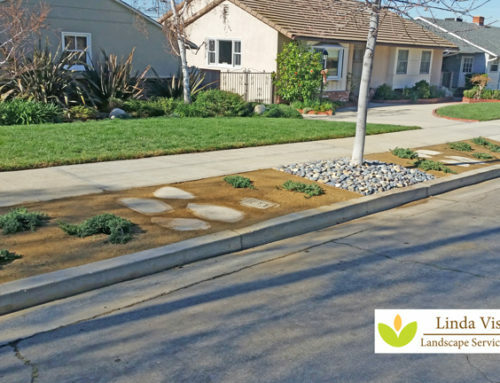 This resident wanted to “up” the Van Nuys curb appeal for his California home while still having drought friendly and water tolerant plants. The result is a lush-looking front yard landscape with lots of color and texture. The client allowed the grass area in the front yard to brown out for easier removal. We removed all the grass and the grass root system, as well as all other plant material in the front yard. This is a picture of the other side of the driveway, with rose bushes lining the brick. All the rose bushes were also removed out of this border bed. The resulting front landscape offers a welcome change. A curved walkway of stabilized DG with 1″ x 6″ bender board was constructed for a soft Asian feel. Colorful drought-tolerant perennials with automatic drip irrigation were placed in 2-3″ bark mulch. Lantanas and purple butterfly bushes lined the walkway. The other side of the driveway was extended with a 2-foot-wide concrete extension. And a new planter was constructed in the remaining property border with drip irrigation, bark mulch, and soft Wistringa evergreen bushes — no thorns. The resulting front landscape is inviting with a sub-tropical feel, even though it’s a water-saving yard.